We’ve all had that moment where we stand in front of the open fridge or pantry … staring. Just waiting for the perfect snack to jump out at us! You know, the snack that wasn’t there the last 3 times we got up to grab a bite? The next time this happens, skip right past the shelves and pull out the drawer where you placed the veggies you bought on your last trip to the market. Vegetables are the perfect snack! They taste good, are good for you and can be eaten raw or cooked. You can enjoy them whole, chopped, or sliced with a dip or spread. The options are endless and the many different flavors will satisfy any craving. Vegetables have high water content too so you’ll feel full in less time than it takes to eat that bag of chips that you were just going to have a handful of (not judging, we’ve all been there!). So, what makes vegetables the perfect snack? The original convenience food, fruits and vegetables! Ready to eat after a rinse under water, fruits and veggies are an easy grab and go snack. With a little extra prep time and an oven, you can make your own veggie chips with kale or sweet potato to pack and go. Just bake them, let them cool and then pack them in reusable containers for pre-portioned chips any day of the week... a healthy alternative to that bag of chips we mentioned earlier. Vegetables are delicious on their own, but add a dip or spread and you’ve got a whole new flavor combination. Peppers and hummus, apples and peanut butter, cucumber slices and ranch dressing… all perfect pairings to power through those 3:00pm hunger pangs. 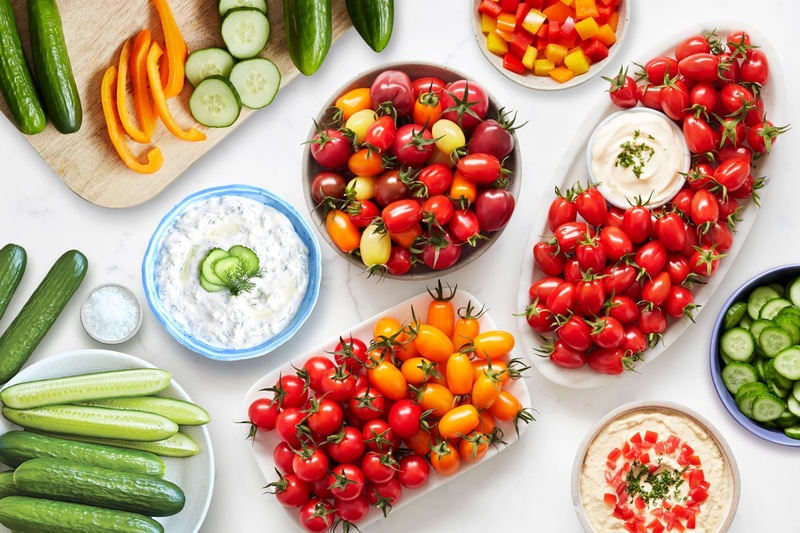 The crunch of a carrot, the snap from a pepper or the smooth texture of an avocado; if you crave a certain texture at snack time, veggies have you covered. Or you can bounce from one texture to the next by mixing different veggies together. Toss your favorites together in a bowl or a reusable container to have on the go when you’re in the mood for a snack. A snack you can feel good about eating! Full or vitamins and nutrients, veggies will curb your craving and leave you feeling satisfied with no regrets and zero guilt. Best of all, adding veggies to your meals and snacks is a proven way to help reduce the risk of many diseases. Packing veggies into your kid’s lunch box for school, or your brown bag for the office, is a win for everyone as a snack. With so many colors, flavors, and textures to pick from, boredom is not an option. And if you have a picky vegetable eater on your hands, try hiding vegetables in their food. No matter what your taste buds are craving, there’s a vegetable for you to snack on. We want to know, what’s your favorite veggie snack?